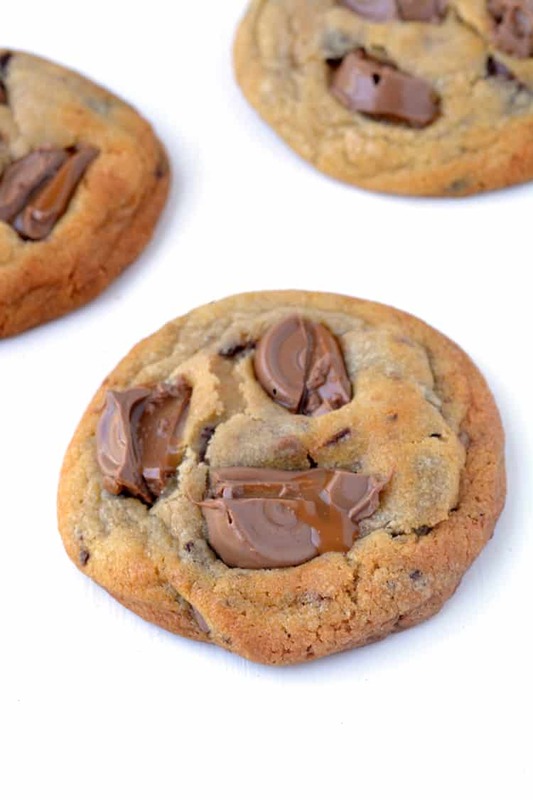 These Rolo Cookies are made with melted butter, so they’re extra soft and chewy. 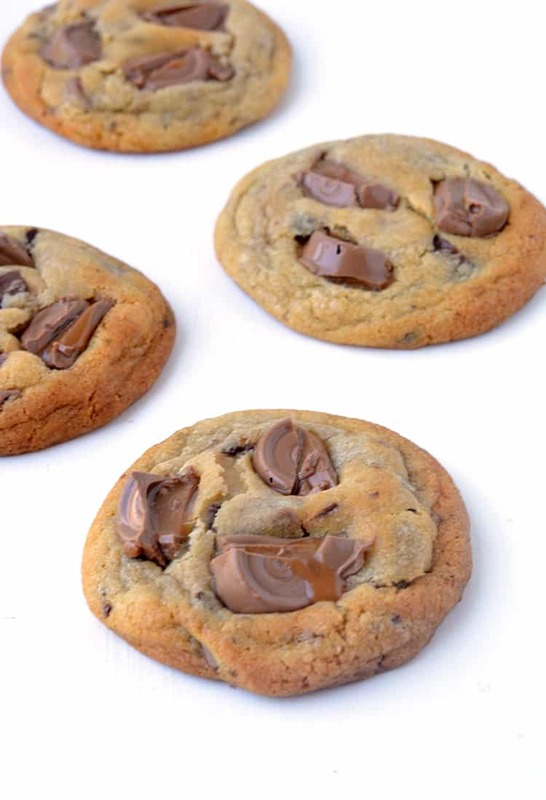 Stuffed with chocolate caramel Rolos and chocolate chips, they’re a cookie lovers dream. You guys! We all love Rolos around here and now there is one more way to eat these delicious chocolate caramel candies. IN COOKIE FORM. And these are not any ordinary cookie. 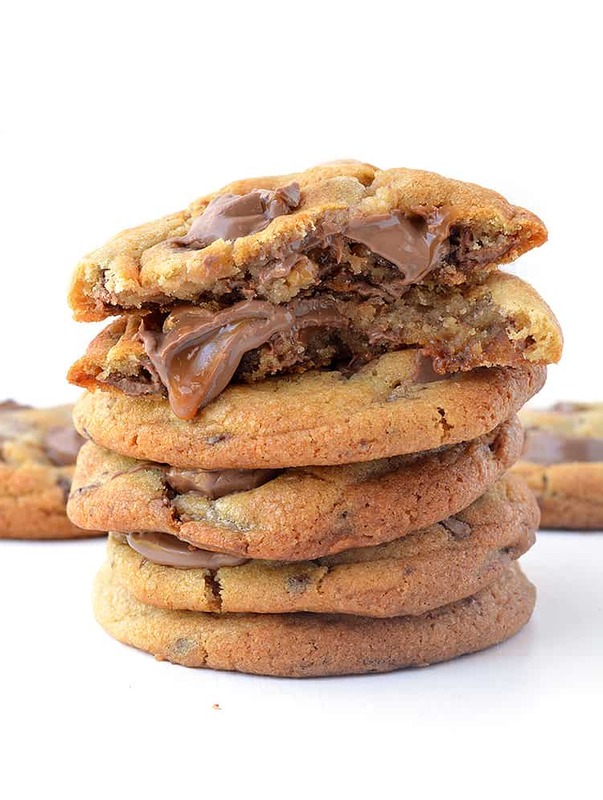 These are soft, buttery, chewy cookies LOADED with dark chocolate chunks and loads of Rolo chocolate. Ever since I made my Rolo Rocky Road and my Rolo Brownies, I haven’t been able to get Rolos off my mind. And it seems you love them too because they’ve been super popular on the blog. 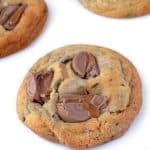 Not only will you absolutely LOVE these cookies because they’re chock-full of chocolate but they have a gorgeous texture. Why you ask? Because instead of creaming the butter and sugar, these babies are made with melted butter. The difference? A soft and chewy cookie that just about melts-in-your-mouth. You will need to chill this cookie dough, it is absolutely mandatory, but you will be rewarded for your patience. Trust Me. 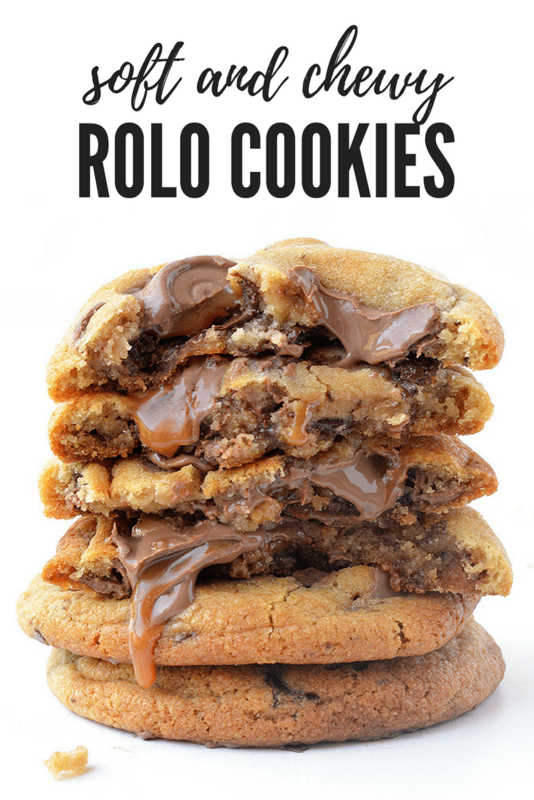 These Rolo Cookies are oozing with chocolate. 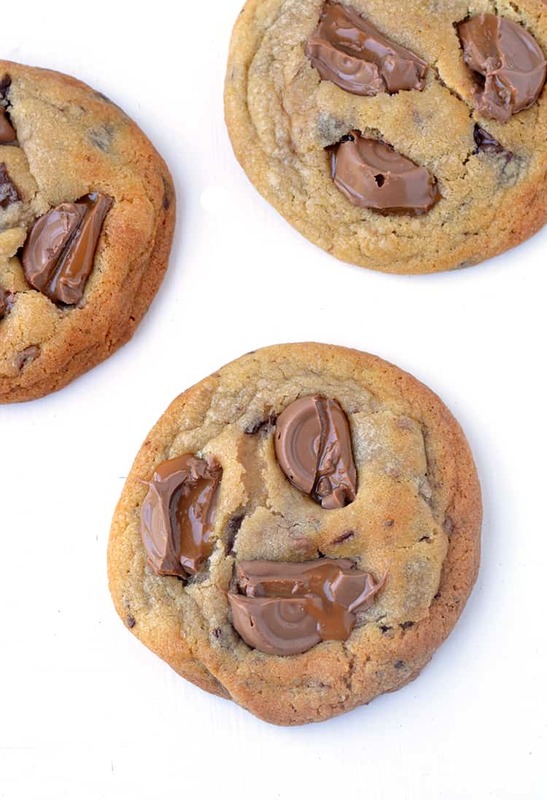 The caramel from the chopped Rolos leaks out and makes the cookie dough buttery and sweet. 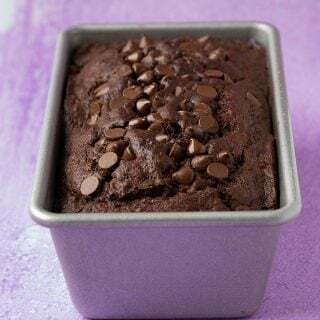 While they will firm up as they cool, you’re bound to get an almost underbaked centre – perhaps the best part. My only advice is to try not over bake them if you want that gooey soft centre. 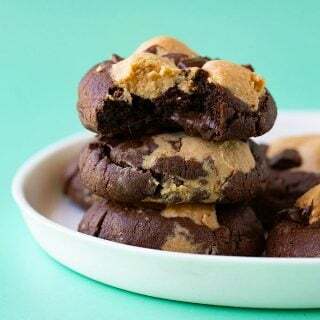 If you prefer a more chewy cookie, you can bake these for 1-2 minutes longer. Either way, you’ll end up with a caramel-icious treat! 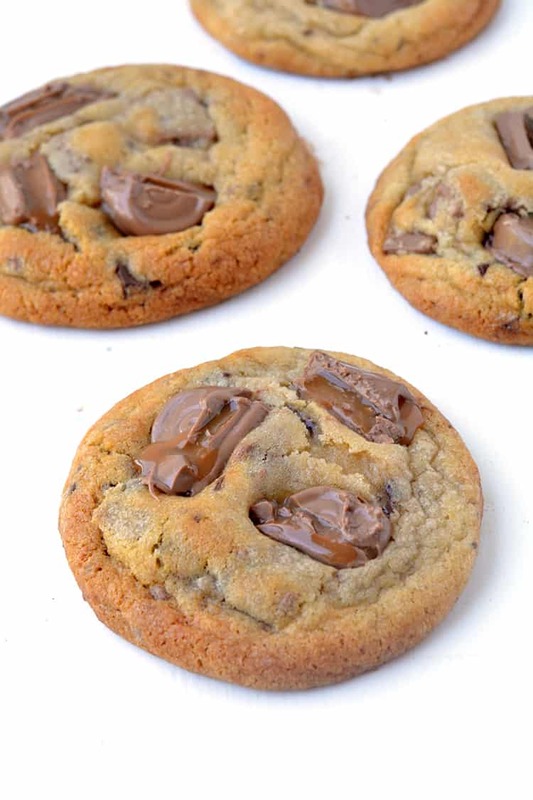 Amazing soft and chewy Rolo Cookies with chunks of chocolate and gooey Rolo chocolate. Add brown sugar, caster sugar, vanilla and egg and stir until smooth. Add flour and baking soda and stir until soft cookie dough forms. Add chocolate and Rolos and stir until combined. Roll large balls of cookie dough using your hands and place on oven tray. Bake for 9-10 minutes*. While the cookie are still warm, add a few extra chopped Rolos on top. The cookies will look under baked but that’s ok – this will ensure they stay soft and chewy even once they’ve cooled. Hi, i’m not really aure where I went wrong, but my cookies leaked caramel all over the cookie sheet and basically cemented to it! I let the dough sit overnight in my fridge and I was hoping that was enough, but it definitely wasn’t. They still tasted amazing though! Just wondering how to make it a bit easier? Hi Riley! Thanks for your comment. I’m glad you loved how these cookies tasted! As for the caramel, I’m not quite sure what happened either. Did you use Rolos or another brand of chocolate? I’ve found Rolos melt and go gooey in the oven, and not hard. Maybe next time try baking the cookies after only 1 hour in the fridge and see if that makes a difference? Hi Sam! I’m so glad you enjoyed these cookies (they’re one of my faves)! Great tip about the extra Rolos – I’ll amend that. Thanks again! 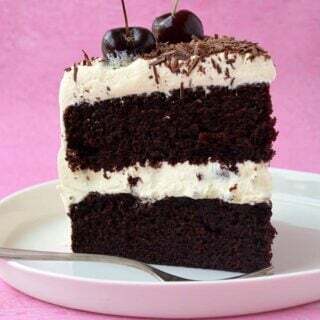 Can I substitute powdered sugar for castor sugar? They were enjoyed around the fire pit and have already been asked to make more! Absolutely loved these! Loved the softer texture.